As an entrepreneur there is a natural ebb and flow to running a small business. There is nothing more exhilarating than bringing your passion to life and turning an idea into something successful. But many small business owners are looking for a lifeline. They may be on the verge of closing their businesses and start running their businesses more effectively. In a previous post, I talked about how many small biz owners in the military community need a reality check and I should know, because this Direction Diva had to do just that. I had to change the way I ran my blog and my overall business to save me from closing operations for good. And I know I’m not alone which is why today is the first post in a new series Save Your Small Business. 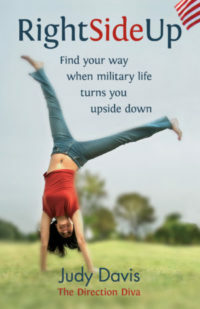 Like many military spouses I am running a business out of a desire to create an income stream in a way that works with my military lifestyle. I wanted to share my experience to help someone else, and before I knew it I was working 13 hour days, traveling all around the country and releasing my first book. Funny thing was that I hadn’t made a dime, in fact profit was a foreign language for my latest entrepreneurial endeavor. Why was this time different? Looking back there were lots of factors, but I think it was different because from the inception in 2011 I never looked at it like a business. I had a passion to make a difference with no concrete plan to profitability. Eventually my message caught on and grew, but my business didn’t grow with it. I had set things up in such a way that there were no income streams and I was required to put money in just to keep things going. It was stressing me out and effecting my family. I had to find a better way before it was to late. So I looked at how I spent my time and realized that I had been grasping at ideas that sounded good but not once did any of my efforts convert to cash flow. Not because they couldn’t but because I hadn’t set them up that way. I understood that without regular revenue I couldn’t keep my business open. I got sick of feeling like I was starting over and building a new reputation with each PCS move. My stress level rose, my productivity waffled and my balance sheets looking like Swiss cheese. Chaos had become my way of life. What my business looked like on the surface was a far cry from the truth going on behind the scenes and I began to resent the time it was taking from my family without any financial benefits. So when I found myself debating whether the stress and lack of profits warranted hanging my “closed until further notice” sign permanently I new things had to change. I love what I do and knew that I had run many successful businesses prior to this one and decided to take a real honest look at this business. Truth #1 : A successful business must have clearly defined, marketable products that are delivered effectively. In order for a business to flourish you have to make your products and services easy to understand and easy to purchase. And up until recently I hadn’t done that. For the first 2 years of running the Direction Diva Brand, the only product I had available for purchase was my speaking. What’s more is that I didn’t do a great job of communicating what topics and messages were unique and distinguishing. Add to that I was a newbie military spouse without a reputation. My blog was more of a diary that I did when I had time rather than a viable income stream. My book sounded awesome but didn’t translate. I didn’t define the problem and communicate a solution nor did I have a real marketing plan. Bottom line I didn’t have products that were clearly defined and available for purchase and therefore I made no money. Simple as that. No matter what your product, whether it’s a blog, a book, a talk or a service it must be clearly defined and presented in a way that your clients can relate to. Without that you are dead in the water. 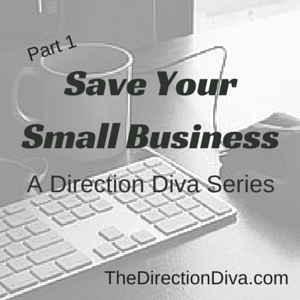 in the Save Your Small Business Series! In the meantime take a moment and evaluate your products and income streams asking if they can be easily purchased by your niche market!